Even if you have Air conditioner or air cooler in your home, you always need a good ceiling fan, as ceiling fan satisfy your need in all session (not only in summer) also it is low cost and long life solution for your heat problem. In summer, there are many areas in India where you must need to have a good ceiling fan which gives you sound sleep as the temperature is bound to cross 40 degree surely. Below are some of the top ceiling fans in India which are from popular brands. In India, brands like Crompton, havells, orient, usha, bajaj fans, luminous are quite popular. They have good service, low price and good performance as well. We have considered many points and then shortlisted below 5 best ceiling fans for you, take a look. These are the top 5 ceiling fans which are quite popular in India, almost all the fans have priced below Rs.1500. now check out the reviews of these fans and features – price in India as well. Orient is one of the popular brand India which is being promoted by MS Dhoni itself. It has quite new style, aerodynamic profile blades, has 18 pole of strong motor with long durability. The rust does not stay on the blades for long time, 100 percent rust free blades. This ceiling fan has 230 CFM of airflow and 1200 blade sweep speed. 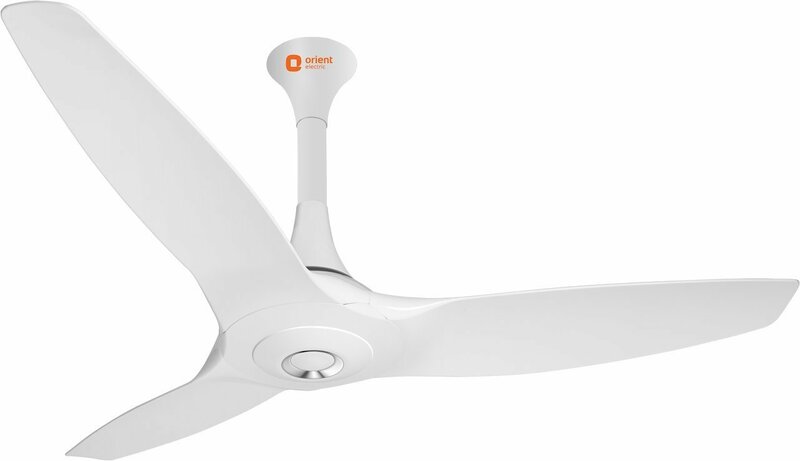 Orient has given 2 years of warranty on this ceiling fan, with 62 watts of power. It has bit costly price but has very good performance, can be used for long time. One of the best ceiling fans for bedrooms. Havells is 2nd most popular brand in budgeted fans. They have very vast range of fans which you can buy it online. We have included havells leganza due to its super awesome performance and stylish design. And guess what, it has under Rs.2799 price in india. This havells fan has 230 cmm of air delivery, high speed double bearing ceiling fan 4 blade, and 2 years of warranty as well. Available in gold and bronze color, if you have fan requirement for large room, you can go with this fan, it surely gives you good air. This is one of the best high speed ceiling fan in india and Usha brand was there when no one owned this fan market. They are constantly having good quality of fans This Usha Trump range has quite low price, high watts of motor and good warranty as well. This fan has good RPM speed with unique blade angle, Electroplated unique design and 78 watts of powerful motor. Usha has given 1 year of warranty on this fan, and priced under Rs.1599. Crompton is most popular brand in india with simple design but long durable fans range. This fan has 320 RPM of speed, has 1200mm of sweep speed and good performance. if you are looking for low budget solution for you bedroom fan, this can be good option. This fan has 77 watts of double bearing motor which has 1 year of warranty from Usha. Low cost solution for your home, with quality product. This fan is available in brown, white, ivory color as well. Bajaj has the most low priced fans in India. This Bajaj Bahar series is priced nearly Rs.1200 only. This fan has 380 RPM of motor speed, 190 CMM of air delivery and 80 watts of most powerful motor. For consistent quality, they have included automatic winding. It has high speed, ribbed blades, quick re-start motor, and double ball bearing and everything. Bajaj has given 2 years of warranty on this fan. Final Words: – These are the best ceiling fans in India, with high quality performance, low price and great features. Take a look and go for the ceiling fan which suits your budget the most. Every fan has their own importance. You can also check Crompton fans special reviews here. The demands of Air Conditioners and Air Coolers are increasing day by day. However, you cannot underestimate the importance of having a Ceiling Fan in your home. During the scorching summer, Ceiling Fan can provide you the sufficient cooling. It is a low cost and long-term solution. Moreover, many people cannot afford Air Conditioner or Air Cooler and so, they can only rely on a good Ceiling Fan. There are a large number of branded Ceiling Fans available in the affordable prices from which you can select the best one for your home. The following reviews on top Companies’ Ceiling Fan can help you to make a better decision. For more ceiling fans review, keep visiting us.